Nestled at the foot of Lone Jack Mountain in northern Idaho is a farm. 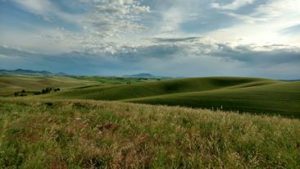 Sweeping views take in the stunning Palouse landscape, including Moscow Mountain to the south and Kamiak butte to the west. Rolling hills of green pastures are home to healthy, happy animals. Three ponds provide water for wildlife and livestock. A large garden produces healthy, naturally grown vegetables. And a flock of free-ranging hens produce delicious eggs. This is Feathered Horses Farm. Our farm is set up to be completely sustainable. Water from our well is pumped using solar power to water the gardens and fill the stock tanks. Solar energy will powers the barn and living quarters – we are currently in the process of building. Follow our progress on the Blog. The Farm is home to Friesian and Gypsian horses, Black Welsh Mountain Sheep, various chickens, and Rottweilers. Our interest lies with rare breeds of animals. We utilize selective breeding to perpetuate and improve the species. Read more about the breeds we are currently working with on our Sheep and Horse pages. We started with bare ground in fall 2015, so the farm is definitely a work in progress. We will share our experiences and adventures with you on our Blog – so please visit often. It is our plan to offer limited Community Supported Agriculture shares, fleeces, and soaps this year. In coming years, we will increase our CSA program and add a Farm Stay opportunity in our barn apartment. We are also planning to host farming and art related workshops. Future plans include a Neighborhood Farm Store where goods from our farm as well as our neighbors’ will be for sale.